The blimps had returned, swaying gently in the sky - a sign to far and wide that the Ploughing was back in business. Only the visible scars - the patched-up stands and the barren wooden platforms sadly devoid of their canvas - told the tale of the devastation that had hit the day before. Invisible were the worries of traders desperately trying to make up the serious losses incurred by missing out on a day of one of the biggest events in the rural calendar. 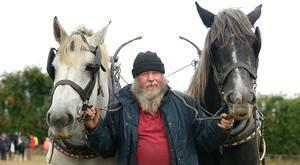 Some 10 smaller traders had been wiped out completely - unable to return to the Ploughing this year. Another 20 to 30 will not be able to attend today for the unscheduled additional day, because of other commitments or because they have to return home, Anna Maria McHugh, the event organiser, said. But if you rebuild it, they will come, has become the mantra of Ploughing '18 - and after a slow start to the morning - and despite the rain, the steel walkways were thronged once more with people keen to enjoy 'the ploughin' yesterday. Nora Ni Ghriofa and her brother Mairtin, from Lettermore, Co Galway, were doing a trawl of the various stands, mopping up complimentary pens, pencils and rulers and stashing them in a wheelie case. "It's our annual pilgrimage," explained Nora, who said they will give them out to friends who are travelling to Vietnam, Laos and Ethiopia, as well as use them for the shoe box appeal for Syria. "I travel a lot myself," said school teacher Nora, who said that she realises how much these small items are valued. "We come from a family of 17 ourselves so we know what it's like. We always passed things on," she said. There was such a large queue for the Aldi tent that the security guard had to plead with people in a desperate effort to stem the tide. "Take it easy guys, it's an Aldi tent," he said. 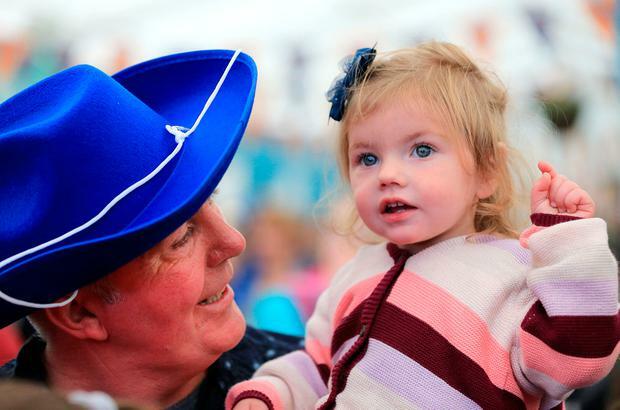 But inside, Mike Denver was pumping out the hits, going from 'Galway Girl' to 'Country Roads' to 'Tommy K' and at the front, girls in blue-branded cowboy hats were line-dancing. "You always get a decent crowd here," said Denver afterwards. He said he was sorry for the smaller traders who had come to the Ploughing, which had cost them "an arm and a leg", only to be wiped out there. 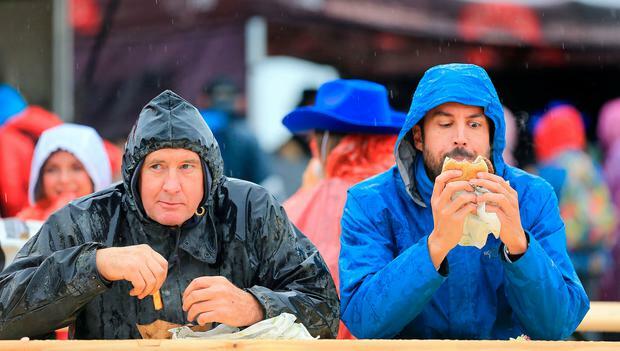 The politicians had returned too - with Micheál Martin hitting out at the Government for its handling of the storm and then Housing Minister Eoghan Murphy grabbing a sneaky burger in the rain, before heading off to the Fine Gael tent to hand out tea and biscuits to punters. "What's that minister - is he from this area?" wondered a woman who had come in to fill up her own environmentally friendly keep cup. After Mr Murphy had defended the Government's stance on the storm, Charlie Flanagan had said something about Brexit and Pat Deering had set off a hand grenade by saying he was "looking forward to welcoming everyone to Carlow in 2019" - thus prematurely announcing the plans of the Ploughing organisers - they were off. But there were more important things cooking besides political rows. 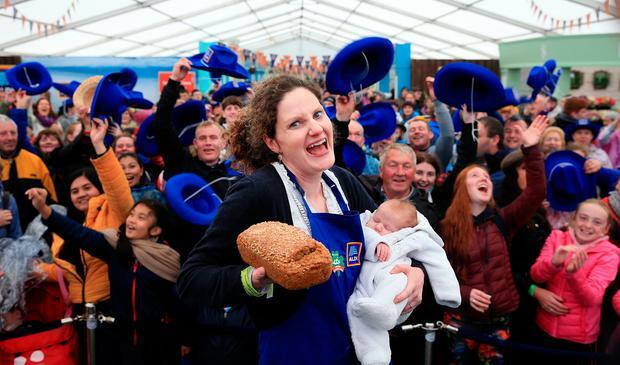 Just two and a half weeks after giving birth to her third son Paddy, Emma Ferguson was left speechless after walking away with the prize for the Aldi brown bread competition, which will see her own bread on the shelves of the store for the next year. Formerly working in marketing and from Rathmolyon, Co Meath, Emma said she'd been up since 2am because Paddy hadn't been sleeping. It was just as well though - because he was sleeping now, she said. The winning recipe was originally her mother's soda bread recipe - but Emma had tweaked it beyond recognition with chia seeds and "whatever I have in the press," she said. Sons Johnny (4) and Charlie (2) love it. "I prefer it with lashings of butter though - I don't know how the judges ate it dry," she said with a shudder.